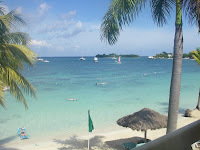 The Happy Planet Index rated Jamaica #3 in their "Top 10 World's Happiest Nations" survey. It came in closely behind Costa Rica (#1) and Dominican Republic (#2). We were greeted by Randolph, the airport porter. He carried our bags from the baggage claim to the van and waited with us until the van arrived. He told us stories and facts about the island. He definitely started our trip off the right way. We were so glad we met him first. Otis, the bartender at the swim-up bar was enjoying his afternoon on the job. 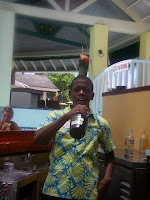 He always remembered our favorite drinks and put the extra effort in presenting them to us. 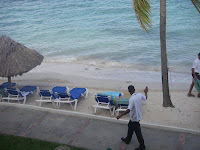 The resort staff ALWAYS greeted you with a smile and a "good morning/afternoon/evening", even if you were in your own little world. 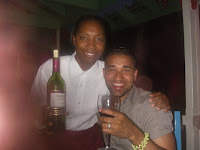 Ophelia at the 4C's restaurant always greeted us with a bottle of Merlot. After 10 minutes there she knew Rob enjoyed the wine and kept close eye on the table. As soon as he was close to an empty bottle she'd appear with a new bottle and a big smile. 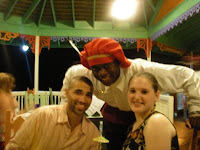 On our first night, the chef came out and greeted all the guests at each table. He asked if he could take a picture with us. He was a sweet man. This man was very talented. 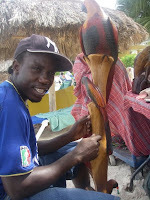 He sat on the beach all day carving these beautiful wooden statues. We bought a bunch of his art to take home to family members. He even let me sit with him and sand one of the statues. He told me all about where he came from and how he made each piece. I was fascinated. There were SO many others that we met along the way who we unfortunately did not get pictures of. We never met an unkind face, inside or outside the resort. No matter where we went everyone smiled and was polite, and if you didn't want to be bothered, no one pestered you. 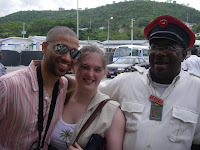 Not only is Jamaica a beautiful island, but a very friendly one. No wonder it's #3 in the world! So I posted pictures of the happy Jamaicans, but I figured I'd post pictures of the gorgeous island so you can see another reason why Jamaica is such a beautiful, happy place. 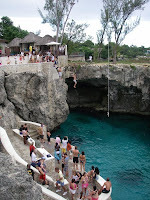 Tourists and locals gathering to jump off the cliffs at the world famous Rick's Cafe in Negril. 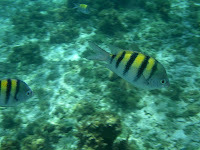 Snorkeling with the tropical fish. 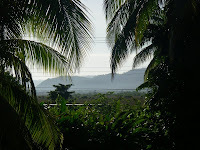 View of the hills through the palm trees. 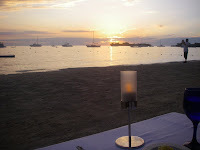 View of the sunset from our dinner table on the beach. 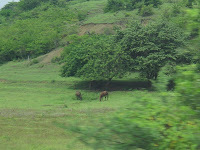 Wild horses grazing on the beautiful green land. 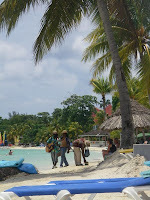 Locals playing music along the beach. It made for a very romantic setting. Beautiful beaches like this for miles. 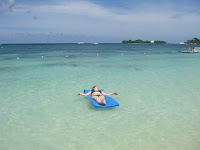 Taking a nap on the ocean's bath-like water.